8 1/2 x 11 Rolled Blank Scroll | Blank Scrolls | Scrolls Unlimited, Inc. Need a little more room for creating your personalized message? The 8 1/2 x 11 scroll is the size of a standard size sheet of paper. 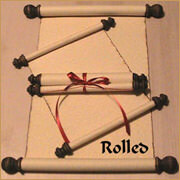 Choose your favorite colors of ribbon or choose a tassel which is used to secure the scroll. Tassels can also be used to hang the scroll for display. Quantity discounts are available for 25 or more.